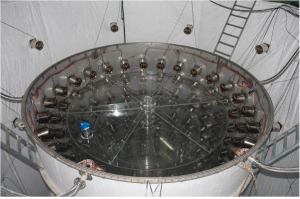 RENO is a short baseline reactor neutrino oscillation experiment in South Korea. The experiment was designed to either measure or set a limit on the neutrino mixing matrix parameter θ13, a parameter responsible for oscillations of electron neutrinos into other neutrino flavours. 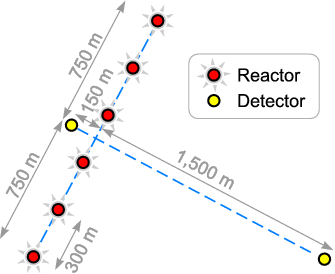 RENO has two identical detectors, placed at distances of 294 m and 1383 m, that observe electron anti-neutrinos produced by six reactors at the Hanbit Nuclear Power Plant (the old name: the Yeonggwang Nuclear Power Plant) in Korea.